Our girl Mari Spiker (@marispiker) is living the NYC dream with her husband and two kids on the Upper West Side – follow her and be prepared to drool! She threw THE most darling party for her 4 year old Will (hi Nora and Will!!) and we begged her to let us post it. It’s our lucky day!! Ready to check it out? Invitations: Mari is a stylist and made this incredible cardboard city scape with boxes and spray paint, so you’re on your own for that amazingness, but she’s sharing all her purchasable sources with us too, which is so kind! The backdrop banner and poster design are by @laurenashleyclements This custom Piñata by @tinipinatas: They had such a quintessential City Kid Party with pretzels and graphic lettering everywhere you turn. Face Painting which always reminds me of You’ve Got Mail. 😉 She did such a good job creating a theme simply by compounding elements of ABCs throughout! Details like the most mini ABC Sprinkles for the cake found here: The cutest Letter Sandwiches using these cookie cutters: This ABC Chalk she bagged up as favors from Etsy Shop LSCreationStation: ABC cookies found at Trader Joe’s ThiBe sure and follow her on Instagram @marispiker and check out her site here. If you have any questions for her she can be reached at hello@marispiker.com She has even more info and images from the party from her blog post here as well. So fun! 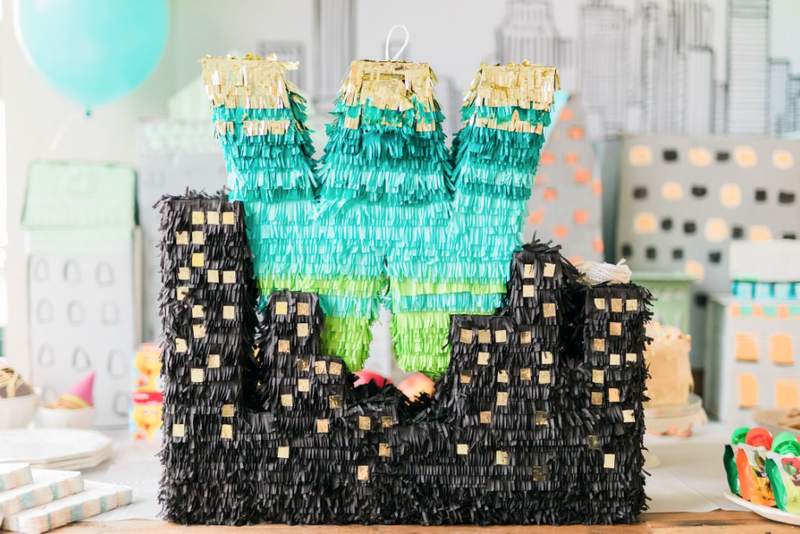 I especially love the cityscape and pinata! Such a UNIQUE idea!! Love it!! !